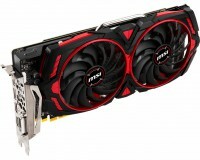 A few weeks ago, MSI has unveiled the RX 570 Armor MK2 graphics card and now the company is ready to announce another model. With the RX 580 Armor MK2, MSI announces a new graphics card based on a custom PCB and a dual-fan cooler. Compared to the previous version, this model sports a new PCB, a new cooler with different heatpipe design and a solid backplate. As we've already mentioned the Armor MK2 series is going to be equipped with a custom PCB as well as a new cooler. Although MSI is using a capable cooler and a solid PCB, the card should come with a tiny factory overclock. Due to this reason, the card is supposed to deliver good thermal performance. While the reference works at 1257MHz/1340MHz Core/Boost frequencies, this factory-overclocked MSI RX 580 Armor MK2 runs at 1366MHz on the Boodt. At the moment there isn't any information regarding the Core clock. On the connector side we find two DisplayPorts 1.4, two HDMI 2.0b connectors and one dual-link DVI port. Since all the latest MSI motherboards have been equipped with an armada of LEDs for RGB lighting, this card might feature several LEDs as well. To improve the looks even further there is a solid backplate. As of today there is no date available when this card will hit the shelves of your local retailer.